The first SECRET ORIGINS OF SUPER-VILLAINS treasury edition must have done some business, because before you knew it, this follow-up was on the stands and in my hands. The cover, while very nicely executed, is a little bit confusing, as of the three villains placed most prominently on the piece, two of them (Bizarro and Captain Boomerang) aren’t represented on the insides. Makes me wonder if there might not have been a different line-up of reprints planned earlier, or whether this piece has originally been commissioned for some other use. This edition of SECRET ORIGINS OF SUPER-VILLAINS isn’t quite as good as the previous one, but it’s still pretty excellent. It opens up with a Catwoman story that both exposes her beginnings and then sets her up with a new status quo–one that ultimately wouldn’t last. When Catwoman is recruited by the mysterious underworld figure Mister X, she’s brought into conflict again with Batman and Robin. But when the Dynamic Duo is imperiled by a falling brick wall, Catwoman saves them, getting conked on te noggin in the process. Reviving Catwoman back at the Bat-Cave, Batman is startled to learn that his adversary doesn’t’ remember anything about her criminal career at all, and believes herself to be simply Selina Kyle, flight stewardess. 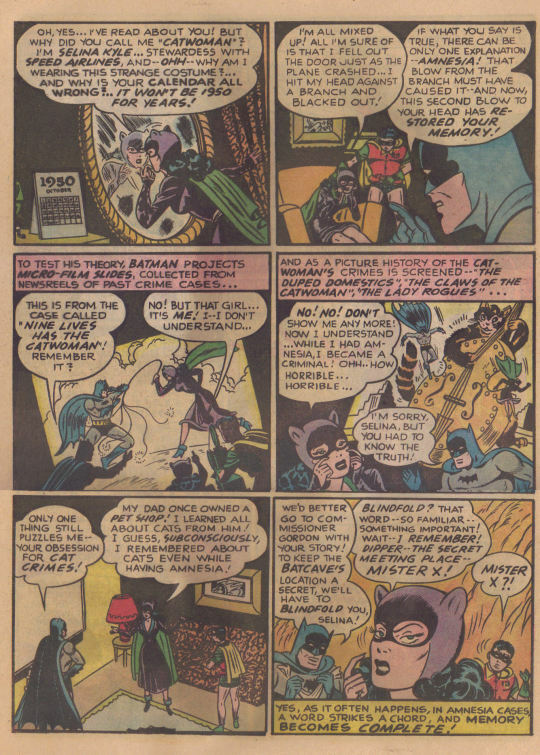 The Masked Manhunter deduces that an earlier head injury was the likely cause of Catwoman’s turn to crime, and that now her memory has been restored. The redeemed Catwoman then aids Batman and Robin in the apprehension of Mister X. Decades later, writer Alan Brennert would use this story as a key element in his great “Autobiography of Bruce Wayne” tale in BRAVE AND THE BOLD. 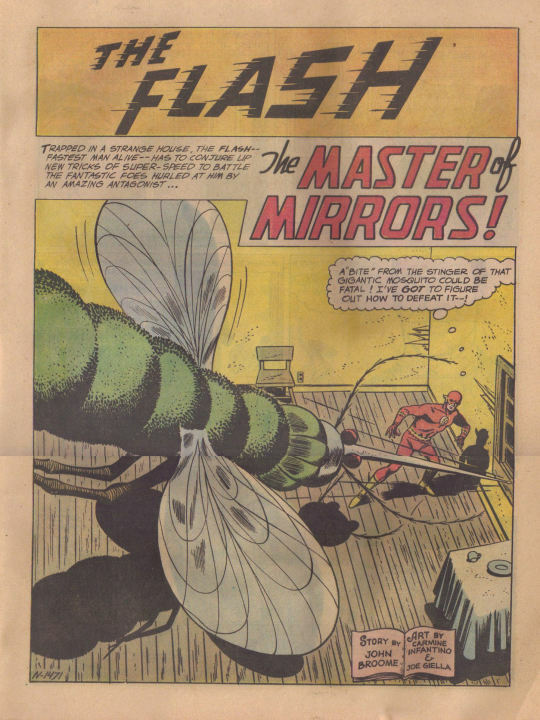 Next up was the first appearance of the Mirror Master in THE FLASH. This should have filled me with glee, and was likely the primary reason why I would have bought this Treasury Edition. But I was never as bit a fan of the Mirror Master as other Flash villains, somehow–in my experience so far, it was Captain Cold who was the Scarlet Speedster’s number one opponent. And this story did nothing to change my mind on this score. In fact, the Flash and the Mirror Master hardly meet in it. Instead, MM uses reflections brought to life to commit crimes, and then when Flash trails one of them back to the rural house Mirror Master is using as a headquarters, the Crimson Comet has to work his way through room after booby-trapped room filled with mirror-generated dangers. So it’s a very quiet story on the action front, a reflection perhaps on the year in which it was crafted and ongoing concerns about how much quasi-violence the Comics Code, then considered a powerful force, would allow in a super hero comic book. 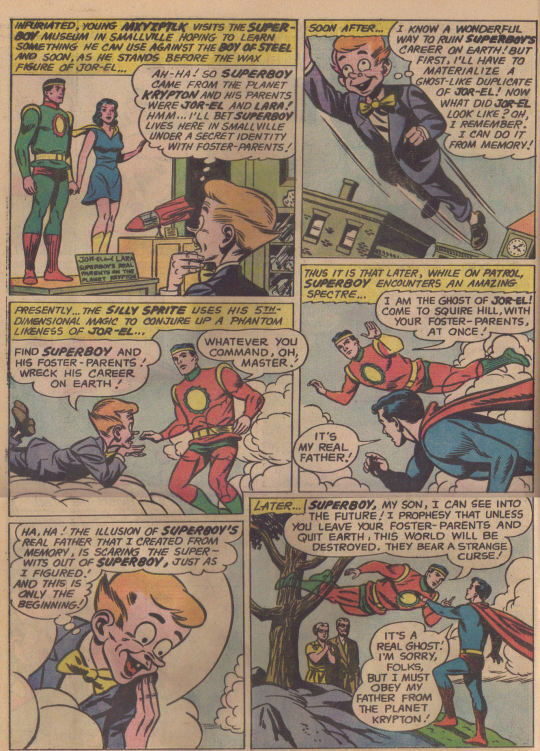 Next up came a Superboy story retroactively relating the first meeting between the Boy of Steel and his nemesis Mister Mxyzptlk, the trickster from the 5th Dimension. I’m afraid that I must risk the wrath of Mark Waid to tell you that there were a number of artists on the Superman titles during this period that did nothing for me, and George Papp ranks high among them. Again, it may have bee a byproduct of the era in which these stories were produced, when publishers were especially afraid of parental backlash killing their sales. But I found Papp’s work to be stiff and lifeless, and generally unappealing. 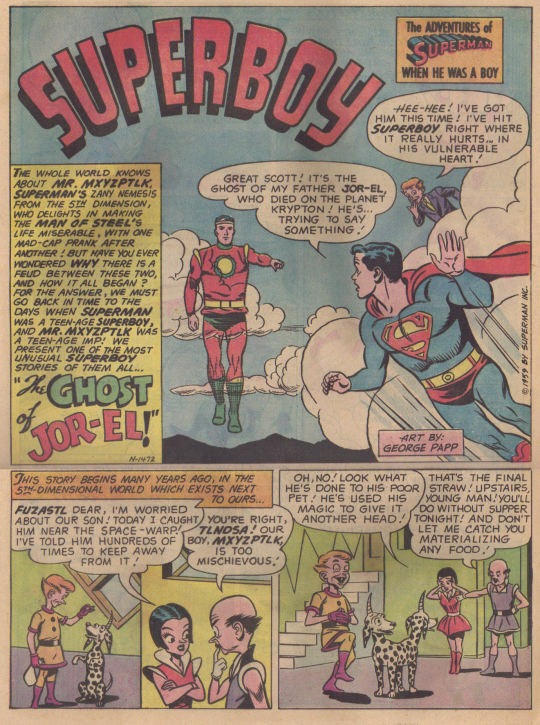 In this story, after being scolded by his parents, young Mxyzptlk runs away from home to the 3rd Dimension, where he delights in playing nasty tricks on Superboy and the other kids of Smallville. 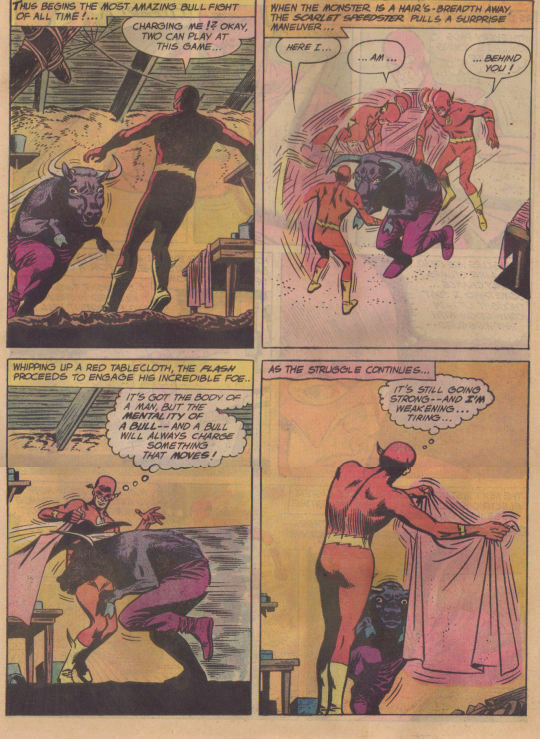 But the fact that, for this one story, Mxyzptlk is color-blind, along with a tip-off from Mxy’s parents in the 5th Dimension, give Superboy the help he needs to exile the imp back to his home dimension–where he’ll be punished for his antics by his folks. 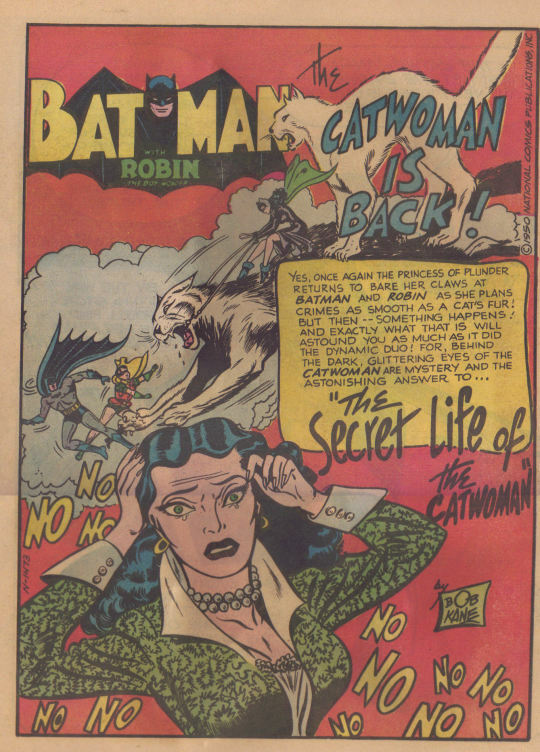 The issue closes out with a vintage Wonder Woman story that introduces the Cheetah. And, in fact, only the first half of that story is reprinted in this issue, presumably for space reasons. But what does run is perhaps the kinkiest Wonder Woman tale of its era, and I’m guessing that it’s only the fact that these Treasury Editions didn’t have to carry the Comics Code that allowed it to be reprinted. 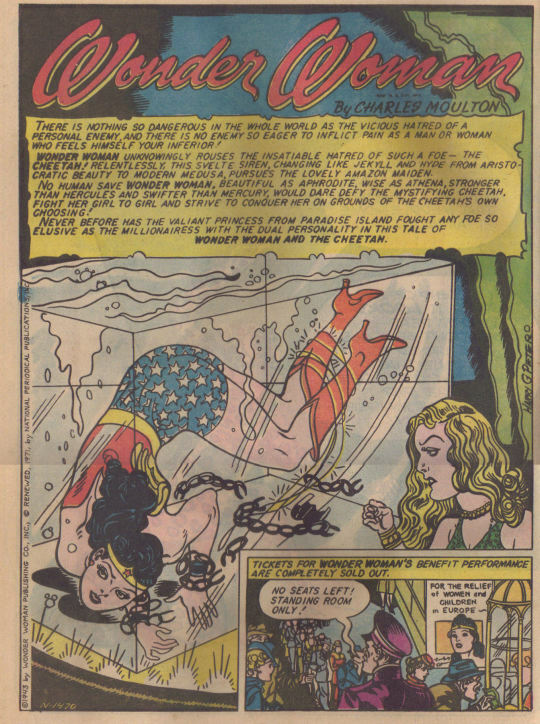 The first half of the story details a charity appearance by Wonder Woman run by Priscilla Rich, who is jealous of Diana’s fame and crowd appeal–so much so that when Wonder Woman does a Houdini-like escape challenge, Priscilla binds her with her own unbreakable lasso in an attempt to kill her. 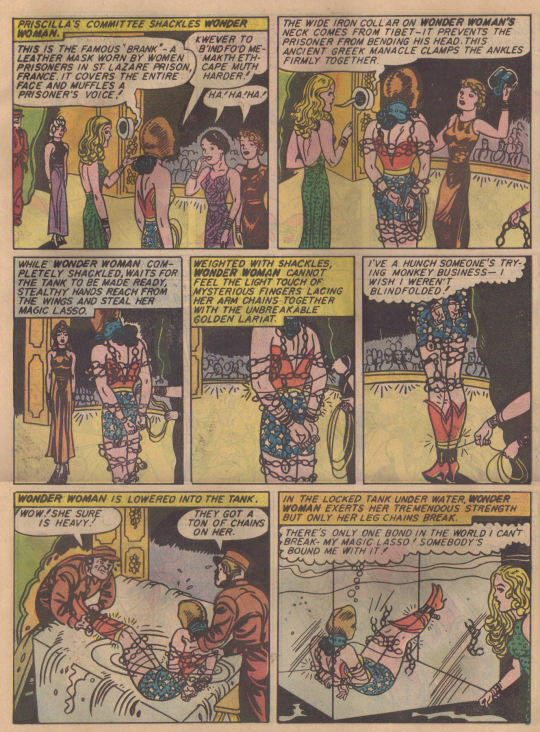 Wonder Woman escapes, but that night Priscilla’s violent tendencies manifest in a split personality that dons a cheetah-skin costume and which commences a campaign of revenge against Wonder Woman and the world. 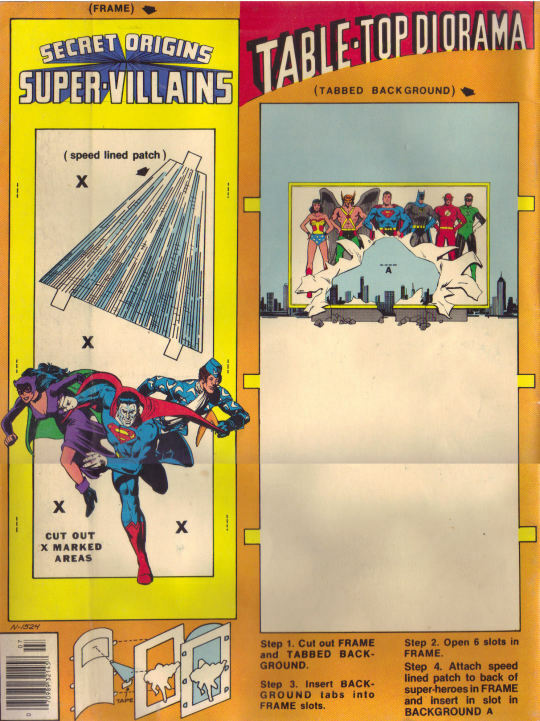 The back cover of the book was a crude cut-out tabletop diorama of the front cover image. By this point I had learned my lesson after destroying a couple fo my earlier treasury Editions attempting to put these things together–so this one remained intact.